Apple Crumble is easy to make and fun to eat. 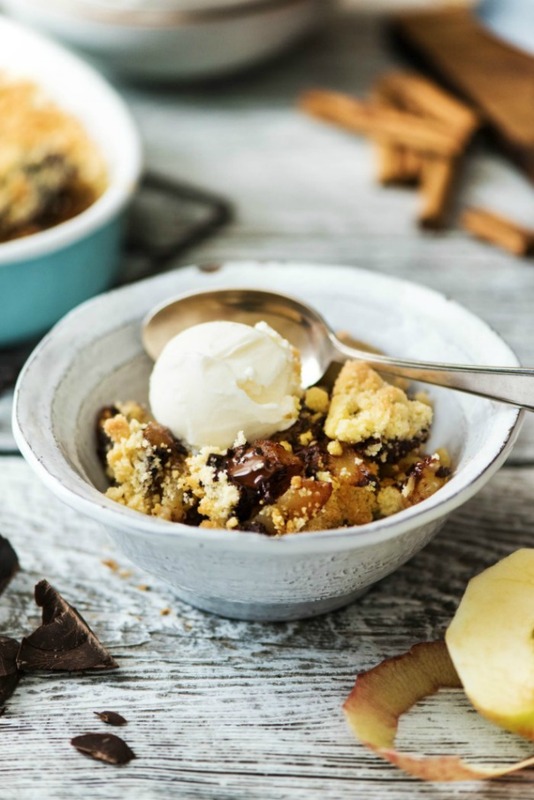 We love making Apple Crumble for dessert, it’s a great option for a crowd too! Apple Crumble is so great and a super delicious dessert recipe. 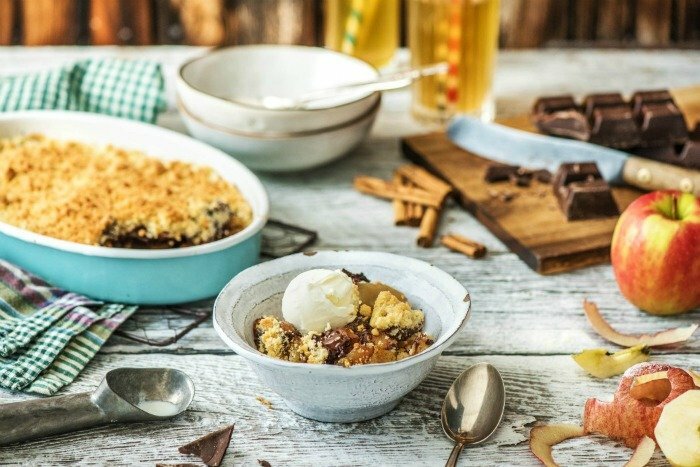 This apple crumble recipe has a delicious chocolate twist that you’ll definitely want to try. Serve your apple crumble after a filling meal of baked pork chops or our meatloaf recipe! 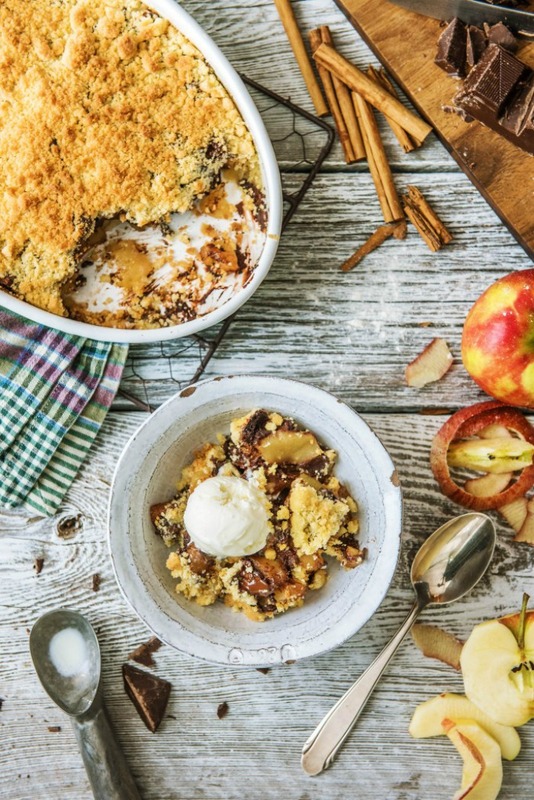 This Apple Crumble recipe is sponsored by Hello Fresh. All opinions belong to Mama Loves Food. Apples – Bramley (in the UK) or Granny Smith (in the US) are the best options. You want a firm tart flavored apple. Granulated sugar – Just plain white sugar for this recipe. Dark chocolate – I like to get a little extra to enjoy with a glass of red after the kids go to bed. Cinnamon stick – You can find whole cinnamon sticks in the spice section of the market. Flour – All purpose flour (not self rising) or gluten free flour work in this recipe. Salted butter – I’m a big fan of butters with a low water content like most European butters for a deeper and more rich flavor. 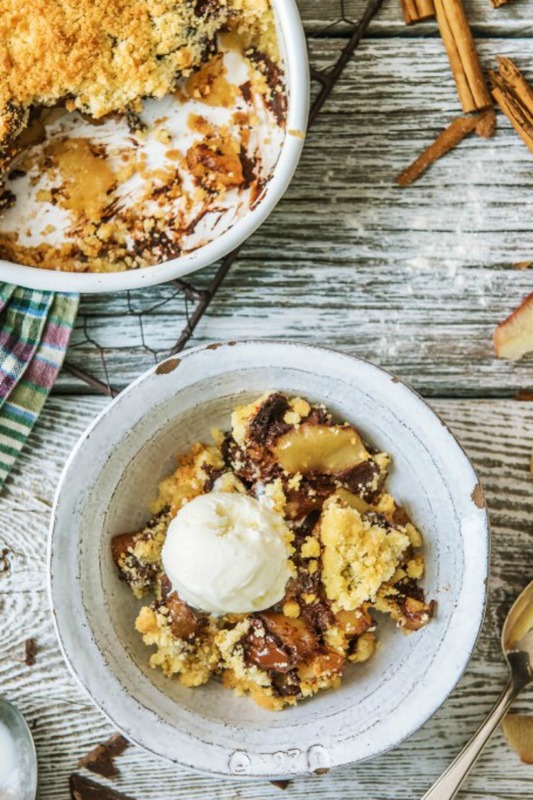 This awesome Apple Crumble recipe is from Hello Fresh. Most folks know of Hello Fresh as a meal delivery service, but they also have great website full of easy to make recipes. 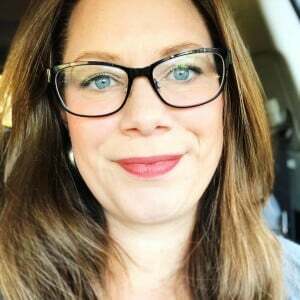 The Hello Fresh website is a great cooking resource for those looking for new recipes or those who lack confidence in the kitchen and need a place to start! First, peel, core and chop the apples into small chunks. Immerse the apples and cinnamon stick in water while you’re chopping, to stop them from turning brown. Next, drain the apples, then add apples plus water and sugar to a sauce pan and cook on medium heat. Continue cooking on medium heat until the apples become mushy. Once mushy, put the apples into an ovenproof dish and remove the cinnamon stick. Break the dark chocolate up into chunks and sprinkle on top of the apples in the dish. Mix flour and sugar in a mixing bowl – add the butter and continue to mix everything together. Finally, pour on top of the stewed apple. then bake. 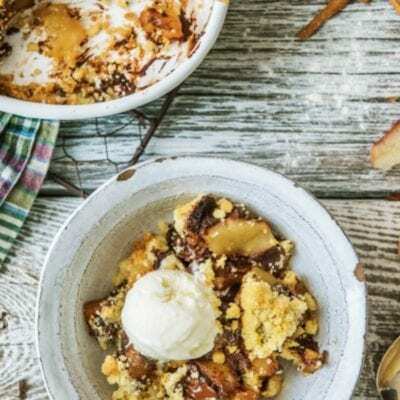 What is the Difference Between Apple Crisp and Apple Crumble? A crisp is a fruit dessert that is topped with a crunchy layer of ingredients and baked until crisp. The topping for a crisp generally includes ingredients like sugar, butter, oats, nuts, flour and sometimes a spice such as cinnamon, tossed together. The dessert is baked until the top of it becomes crispy browned. A crumble, like the one we have here, is also a baked fruit dessert with a layer of topping. A crumble, however, rarely includes oats or nuts, and is instead usually a streusel-like combination of flour, sugar and butter. Occasionally, some variations do include oats or nuts. 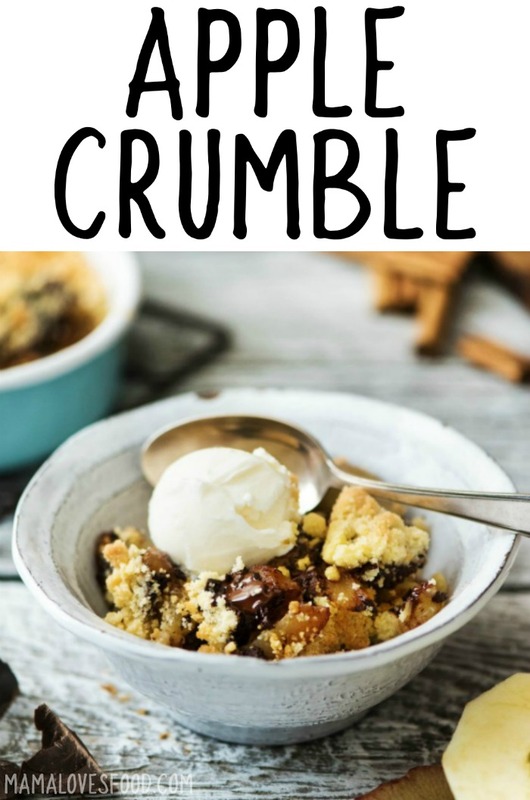 A crumble topping is generally more clumpy than a crisp topping, but not as clumpy as a cobbler topping (which is more like a biscuit dough). Rustic baking dish – Is it even really a dessert if it’s not served in a pretty dish? (Well of course it is, but I do love a pretty dish). Saucepan – I like a stainless steel saucepan, as opposed to one with non-stick coating. Don’t try to save time by putting uncooked apples in your crumble. To bring out the best flavor and texture, stewing the apples before baking them is an important step. Make sure to add the full amount of butter called for in the recipe to get the perfect crispy golden brown topping. The apples have a lot of natural sugar which will be further brought out in cooking. Don’t try to add extra sugar as it may become too sweet. Don’t skip adding the cinnamon stick to your apples while they are stewing to give an extra level of flavor. Apple crumble is best enjoyed hot and fresh from the oven for the best experience. You want the apples to be soft and warm while the topping is crispy. Apple Crumble is easy to make and fun to eat. We love making Apple Crumble for dessert, it's a great option for a crowd too! If you're planning to cook it straight after preparing, preheat the oven to 350F. If you want, however, you can make the crumble beforehand, and cook it later. First, you need to prepare the apples. Half fill a large saucepan with water, and peel, core and chop the apples into 1-2 cm chunks. Place apples and the cinnamon stick in the saucepan while you’re chopping, to stop them from turning brown. Drain all of the water from the saucepan, add another 2 tbsp of water and half of the sugar, and cook on medium heat. Place the flour and the remaining sugar in a mixing bowl. Add the butter and use your hands to mix everything together until the mixture resembles large breadcrumbs. Pour this evenly on top of the stewed apple. If you are making the crumble in advance, cover it with cling film and allow to cool to room temperature before placing in the fridge. When ready to cook, place the crumble in the preheated oven and bake for 30 minutes at 350 degrees. Don't worry if the crumble doesn't looked cooked properly, it most likely is! Eat hot from the oven. Congratulations about your partnership with the Hello Fresh Organization. I love your business model. But (isn’t there always a BUT? ), don’t you think that a mention of the subscription costs included with Hello Fresh would be appropriate and in the best interests of your many followers? Also, don’t you think it would be great if you took a few minutes to provide an equivalency for those metric quantities of ingredients that this recipe specifies, such as the many references to the centimeter (cm) and the gram (g)? Any idea as to why the measure of the oven temperature was in Fahrenheit (350F)and not Centigrade? BTW, this recipe is delicious, and the use of Granny Smith Apples and salted butter makes it work! I suggest adding a squeeze of lemon juice to the water to help prevent the browning of your apple slices. Thanks for listening! Happy cooking and happy holidays everyone!